#Filename, The name of the attachment file. #Document, Give each attachment a unique name and store it in the file system organized in one of the following ways. Store attachments in the folder which contains the CSV file where you listed your attachments. Store them in the sub-folder named Attachments. It must be a sub-folder of the folder where the attachments list CSV file is stored. #Regarding, Is the name of the record in CRM (Account, Contact etc.) against which this attachment will be stored. 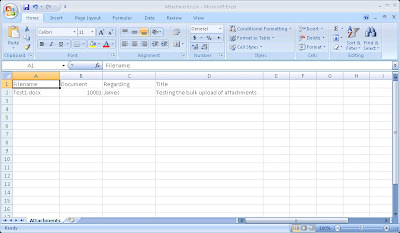 #Title, The title of the Attachment in CRM. #Here I show the attachment file that is being uploaded. Notice that I've given it a unique name and mentioned the same in the excel file above. #You are ready to begin the Migration. 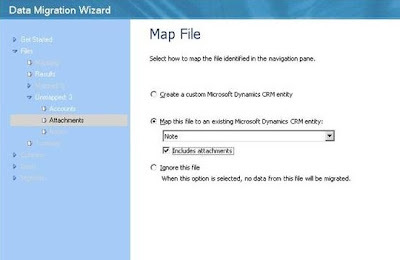 Here map the CSV file that contains the annotations to the Note entity. If the CSV file contains attachments, check the "Includes Attachments" checkbox as shown below. #If the CSV file contains notes you can ignore the checkbox. Here is a figure that shows how you can upload Notes. 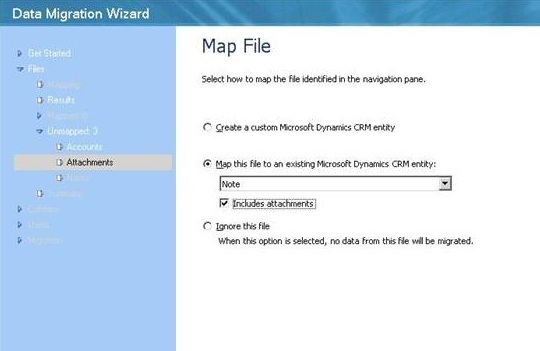 #Map the columns as usual and if you are uploading attachments map the "Document" Column with the "Document" attribute in CRM. You are done. The attachments are now accessible on CRM.